A composition comprising particulate carbonaceous material and a conducting polymer containing hetero atoms. The composition can further comprise a metal. Devices comprising the composition can be constructed including supported electrocatalysts, membrane electrode assemblies, and fuel cells. A method for preparing the composition comprises oxidatively polymerizing a monomer of a conducting polymer containing hetero atoms in the presence of a carbonaceous material wherein the oxidative polymerization takes place in the presence of a metal-containing oxidizing agent. The method grafts the conducting polymer to the carbonaceous material while essentially simultaneously metallizing the composition. This application is a continuation-in-part of U.S. application Ser. No. 10/445,090 filed May 23, 2003, which claims priority to U.S. Provisional Application Serial No. 60/382,666, filed May 23, 2002, both of which are hereby incorporated by reference in their entireties. The current description deals with proton exchange membrane (a.k.a. polymer electrolyte membrane) (PEM) fuel cells (a.k.a. solid polymer electrolyte (SPE) fuel cell, polymer electrolyte fuel cell, and solid polymer membrane (SPM) fuel cell). A polymer electrolyte membrane fuel cell (PEMFC) comprises a proton conductive polymer membrane electrolyte  10 sandwiched between electrocatalysts (a cathode 50 and an anode 20) (see, e.g., FIG. 1). This electrochemical process is a non-combustion process which does not generate airborne pollutants. Therefore, fuel cells are a clean, low emission, highly efficient source of energy. Fuel cells can have 2-3 times greater efficiency than internal combustion engines and can use abundant and/or renewable fuels. Fuel cells produce electricity, water, and heat using fuel  90 and oxygen 80. Water (liquid and vapor) is the only emission when hydrogen is the fuel. The two half-reactions normally occur very slowly at the low operating temperature of the fuel cell, thus catalysts  56 are used on one or both the anode 20 and cathode 50 to increase the rates of each half reaction. Platinum (Pt) has been the most effective noble metal catalyst 56 to date because it is able to generate high enough rates of O2 reduction at the relatively low temperatures of the PEM fuel cells. Kinetic performance of PEM fuel cells is limited primarily by the slow rate of the O2 reduction half reaction (cathode reaction) which is more than 100 times slower than the H2 oxidation half reaction (anode reaction). The O2 reduction half reaction is also limited by mass transfer issues. As fuel  90, such as hydrogen, flows into a fuel cell on the anode side, a catalyst 56 facilitates the separation of the hydrogen gas fuel into electrons and protons (hydrogen ions). The hydrogen ions pass through the membrane 10 (center of fuel cell) and, again with the help of the catalyst 56, combine with an oxidant 80, such as oxygen, and electrons on the cathode side, producing water. The electrons, which cannot pass through the membrane 10, flow from the anode 20 to the cathode 50 through an external circuit containing a motor or other electrical load, which consumes the power generated by the cell. A catalyst  56 is used to induce the desired electrochemical reactions at the electrodes 20, 50. The catalyst 56 is often incorporated at the electrode/electrolyte interface by coating a slurry of the electrocatalyst particles 56 to the electrolyte 10 surface. When hydrogen or methanol fuel 90 feed through the anode catalyst/electrolyte interface, electrochemical reaction occurs, generating protons and electrons. The electrically conductive anode 20 is connected to an external circuit, which carries electrons by producing electric current. The polymer electrolyte 10 is typically a proton conductor, and protons generated at the anode catalyst migrate through the electrolyte 10 to the cathode 50. At the cathode catalyst interface, the protons combine with electrons and oxygen to give water. The catalyst  56 is typically a particulate metal such as platinum and is dispersed on a high surface area electronically conductive support 52. The electronically conductive support material  52 in the PEMFC typically consists of carbon particles. Carbon has an electrical conductivity (10−1-10−2 S/cm) which helps facilitate the passage of electrons from the catalyst 56 to the external circuit. Proton conductive materials 54 such as Nafion® are often added to facilitate transfer of the protons from the catalyst 56 to the membrane interface. To promote the formation and transfer of the protons and the electrons and to prevent drying out of the membrane  10, the fuel cells are operated under humidified conditions. To generate these conditions, hydrogen fuel 90 and oxygen 80 gases are humidified prior to entry into the fuel cell. In a supported electrocatalyst (52+56), carbon is relatively hydrophobic, and as such, the boundary contact between the reactive gases, water and the surface of the solid electrodes made of carbon contributes to high electrical contact resistance and ohmic power loss in the fuel cell resulting in lower efficiency of the fuel cell. An ordinary electrolyte is a substance that dissociates into positively charged and negatively charged ions in the presence of water, thereby making the water solution electrically conducting. The electrolyte in a PEM fuel cell is a polymer membrane  10. Typically, the membrane material (e.g., Nafion®) varies in thickness from 50-175 μm. Polymer electrolyte membranes 10 are somewhat unusual electrolytes in that, in the presence of water, which the membrane 10 readily absorbs, the negative ions are readily held within their structure. Only the protons contained within the membrane 10 are mobile and free to carry positive charge through the membrane 10. Without this movement within the cell, the circuit remains open and no current would flow. Polymer electrolyte membranes  10 can be relatively strong, stable substances. These membranes 10 can also be effective gas separators. Although ionic conductors, PEM do not conduct electrons. The organic nature of the structure makes it an electronic insulator. Since the electrons cannot move through the membrane 10, the electrons produced at one side of the cell must travel through an external circuit to the other side of the cell to complete the circuit. It is during this external route that the electrons provide electrical power. (3) the ion clusters consisting of sulfonic acid ions, SO 3 −, H+. The negative ions, SO 3 −, are permanently attached to the side chain and cannot move. However, when the membrane 10 becomes hydrated by absorbing water, the hydrogen ions become mobile. Ion movement occurs by protons, bonded to water molecules, migrating from SO3 − site to SO3 − site within the membrane. Because of this mechanism, the solid hydrated electrolyte is a good conductor of hydrogen ions. The catalyst support  52 serves to conduct electrons and protons and to anchor the catalyst 56 (e.g., noble metal). Many efforts have been aimed at lowering the costs of fuel cells by lowering noble metal (e.g., platinum) catalyst 56 levels due to noble metal's cost. One way to lower this cost is to construct the catalyst support layer 52 with the highest possible surface area. The electrodes  20, 50 of a fuel cell typically consist of carbon 52 onto which very small metal particles 56 are dispersed. The electrode is somewhat porous so that gases can diffuse through each electrode to reach the catalyst 56. Both metal 56 and carbon 52 conduct electrons well, so electrons are able to move freely through the electrode. The small size of the metal particles 56, about 2 nm in diameter for noble metal, results in a large total surface area of metal 56 that is accessible to gas molecules. The total surface area is very large even when the total mass of metal 56 is small. This high dispersion of the catalyst 56 is one factor to generating adequate electron flow (current) in a fuel cell. Conducting polymers are a class of conjugated double bond polymers whose electrical conductivities are comparable to the conductivities of semiconductors to metals, in the range of 0.1 to 100 S/cm. 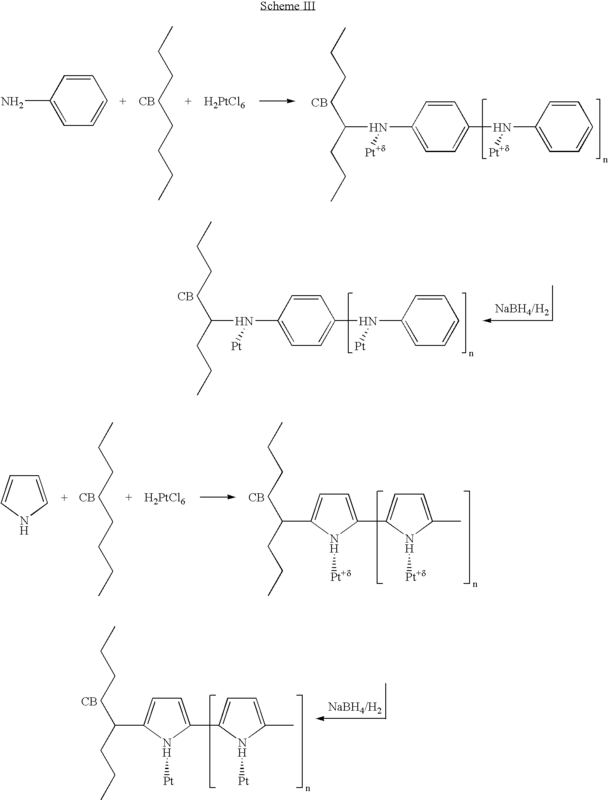 Typical examples of conducting polymers include polyaniline, polypyrrole, polythiophene, polyfuran, and polyphenylene. Both polyaniline and polypyrrole catalyst support  52 materials have shown improved fuel cell efficiency (e.g., U.S. Pat. No. 5,334,292 and WO 01/15253). However, the long-term stability of these materials has not been demonstrated in electrode environments in cyclic operations. Conducting polymers alone used as catalyst support  52 material have higher costs, lower surface area, and lower stability compared to those supports 52 based on carbon. The majority of the cost associated with electrodes is attributed to the high cost of the metal, which makes up the catalyst  56. Only those catalytic sites exposed on the surface of the catalytic particles contribute to the catalytic activity of the electrode and, thus, electrodes with the highest fraction of the metals accessible to the reaction should be the most effective. Carbon supports 52 with high porosity result in “trapped” metal sites that are not accessible for electrode reaction. The extent of dispersion of the metal catalyst 56 on the support material 52 and the stability of such high dispersion in use, i.e., resistance of the catalyst against sintering and/or agglomeration, is directly related to the surface area and the availability of surface sites on which the dispersed metal 56 can be anchored. It is desirable to provide a catalyst support  52 that has a higher surface area and also a higher surface density of anchoring surface sites than catalytic supports consisting exclusively of carbon. This would increase and stabilize the dispersion of the metal catalyst 56 and, thus, limit the amount of catalyst 56 needed. The present invention provides a PEMFC electrode which can be made more cost-effective than electrodes having exclusively carbon support or exclusively conducting polymer support. Backpressure of 30 psi was maintained on the cell during analysis. Potentials depicted were not corrected for iR drop. “Protons,” sometimes referred to in a the fuel cell context as H +, hydrogen ions, or positive ions, are a positively charged portion of hydrogen atom which results from reaction over catalyst material. The carbonaceous material can be carbon black. The choice of carbon black in the invention is not critical. Any carbon black can be used in the invention. Carbon blacks with surface areas (nitrogen surface area, NSA) of about 200 to about 1000 m  2/g, for example, 200, 220, 240, 250, 300, 350, 400, 450, 500, 550, 600, 650, 700, 750, 800, 850, or 950 m2/g can be used. Specifically, a carbon black with a surface area of 240 m2/g (NSA, ASTM D6556) can be used. It is preferred that the carbon black have fineness effective for metal dispersion. It is preferred that the carbon black have structure effective for gas diffusion. The combination of anode/membrane/cathode (electrode/electrolyte/electrode) in a fuel cell is referred to as the membrane/electrode assembly (MEA). The evolution of MEA in PEM fuel cells has passed through several generations. The original membrane/electrode assemblies were constructed in the 1960s for the Gemini space program and used 4 mg Pt/cm 2 of membrane area, which generated about 0.5 amperes per mg Pt. Current technology varies with the manufacturer, but total Pt loading has decreased from the original 4 mg/cm2 to about 0.5 mg/cm2. Laboratory research now uses Pt loadings of 0.15 mg/cm2 which are able to generate about 15 amperes per mg Pt. Membrane/electrode assembly construction varies greatly, but the following is one of the typical procedures. The supported catalyst/electrode material is first prepared in liquid “ink” form by thoroughly mixing together appropriate amounts of supported catalyst (powder of metal, e.g., Pt, dispersed on carbon) and a solution of the membrane material (ionomer) dissolved in a solvent, e.g., alcohols. Once the “ink” is prepared, it is applied to the surface of the solid membrane, e.g., Nafion®, in a number of different ways. The simplest method involves painting the catalyst “ink” directly onto a dry, solid piece of membrane. The wet supported catalyst layer and the membrane are heated until the catalyst layer is dry. The membrane is then turned over and the procedure is repeated on the other side. Supported catalyst layers are then on both sides of the membrane. The dry membrane/electrode assembly is next rehydrated by immersing in dilute acid solution to also ensure that the membrane is in the H + form needed for fuel cell operation. The final step is the thorough rinsing in distilled water. The membrane/electrode assembly is then ready for insertion into the fuel cell hardware. The thickness of the membrane in a membrane/electrode assembly can vary with the type of membrane. The thickness of the supported catalyst layers depends on how much metal is used in each electrode. For example, for supported catalyst layers containing about 0.15 mg Pt/cm 2, the thickness of the supported catalyst layer can be close to 10 μm. The thickness of the supported catalyst layer can be, for example, about 0.1 to about 50 μm, more specifically on the order of about 20 to about 30 μm. Thicknesses above 50 μm appear to increase the mass transfer problems too much to be effective. An appropriate thickness of supported catalyst can be determined by one of skill in the art. The membrane of the MEA can be an ionomer, specifically a perfluorosulfonate ionomer. More specifically, the membrane can be a poly(tetrafluoroethylene)-based cation exchange ionomer such as Nafion® (DuPont, Wilmington, Del. ; Fayetteville, N.C.). Nafion® is a perfluorinated polymer that contains small proportions of sulfonic or carboxylic ionic functional groups. Its general chemical structure can be seen below, where X is either a sulfonic or carboxylic functional group and M is either a metal cation in the neutralized form or an H + in the acid form. 750 ml deionized (DI) water. A solution containing 45 g of ammonium persulfate in 250 ml deionized water was added to the carbon black slurry, and the stirring continued at room temperature for 2 hrs. The carbon black slurry was filtered, washed with DI water, dried at 110° C. for 4 hrs., and pulverized. 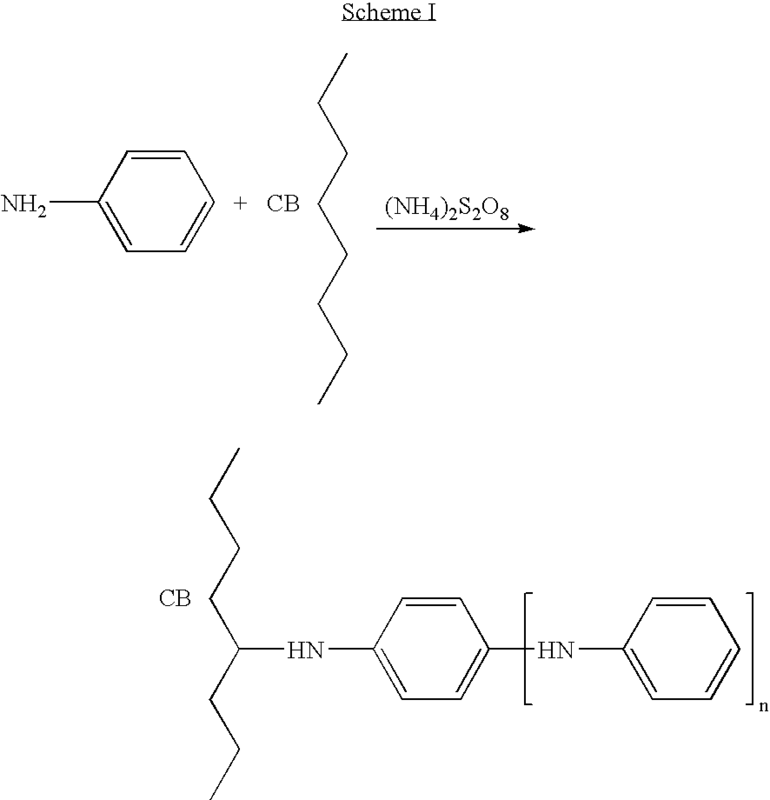 The resultant carbon powder contains grafted polyaniline (CB—HN—C 6H4)n conducting polymer as shown in Scheme I as demonstrated by FIG. 2. 20 g pyrrole (Aldrich) was added to the slurry with continuous stirring. 100 ml of 3 M FeCl 3 solution was added to the carbon black slurry, and the stirring continued at room temperature for 1 hr. The carbon black slurry was filtered, washed with DI water, dried at 110° C. for 4 hrs., and pulverized. 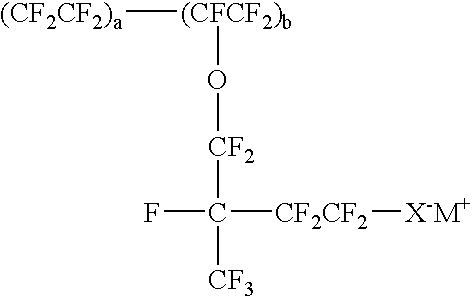 The resultant carbon powder contains grafted polypyrrole (CB—HN—C4H2)n conducting polymer as shown in Scheme II. 20 g pyrrole (Aldrich) was added to the slurry with continuous stirring. 100 ml of 10% H 2O2 solution was added to the carbon black slurry, and the stirring continued at room temperature for 1 hr. The carbon black slurry was filtered, washed with DI water, dried at 110° C. for 4 hrs., and pulverized. 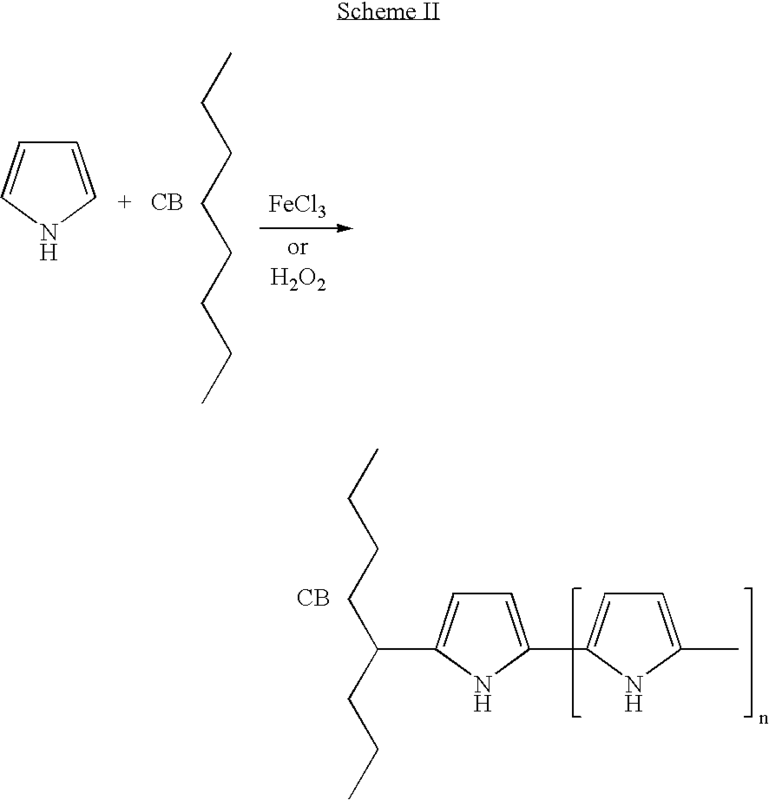 The resultant carbon powder contains grafted polypyrrole (CB—HN—C4H2)n conducting polymer as shown in Scheme II as demonstrated in FIG. 3. Example 6 Platinization of Polypyrrole-Grafted Carbon Black 4 g of polypyrrole grafted carbon black (made in Example 3) was dispersed in 300 ml DI water. A slurry was made using 2 g of carbon black (CDX-975, surface area of 240 m  2/g and oil absorption of 170 ml/100 g) in 400 ml of deionized water. A slurry was made using 2 g of carbon black (CDX-975, surface area of 240 m 2/g and oil absorption of 170 ml/100 g) in 400 ml of deionized water. A slurry was made using 2 g of carbon black (CDX-975, surface area of 240 ml 2/g and oil absorption of 170 ml/100 g) in 400 ml of reagent ethanol. A slurry was made using 2 g of carbon black (CDX-975, surface area of 240 m 2/g and oil absorption of 170 ml/100 g) in 400 ml of reagent ethanol. wherein the oxidative polymerization takes place in the presence of a metal-containing oxidizing agent. 2. The method of claim 1 wherein the carbonaceous material is carbon black, graphite, nanocarbons, fullerenes, fullerinic material, finely divided carbon, or mixtures thereof. 3. The method of claim 1 wherein the carbonaceous material is carbon black. 4. The method of claim 1 wherein the monomer of a conducting polymer is an amino aryl or a nitrogen heterocycle. 5. The method of claim 1 wherein the metal-containing oxidizing agent is chloroplatinic acid. 6. The method of claim 1 wherein the oxidatively polymerizing comprises adding a metal-containing oxidizing agent to a mixture of the carbonaceous material and a monomer of the conducting polymer. 7. The method of claim 1 wherein the conducting polymer is polyaniline, polypyrrole, polyfuran, polythiophene, poly(p-phenylene-oxide), poly(p-phenylene-sulfide), substituted conducting polymers, or mixtures thereof. 8. The method of claim 1 further comprising adding a reducing agent. 9. The method of claim 8 wherein the reducing agent is formaldehyde, formic acid, sodium borohydride, hydrogen, hydrazine, hydroxylamine, or a mixture of reducing agents. 10. A composition made by the method of claim 1. 12. A device comprising the composition of claim 10. 13. A fuel cell comprising the composition of claim 10. 14. The device of claim 12 wherein the device is a fuel cell, battery, or a capacitor. DE69113542D1 (en) 1990-07-10 1995-11-09 Agfa Gevaert Nv Improved stabilization of dispersions of metal oxides and / or carbon black in water.